Sr. Mary Ellen Gemmell, CSFN, calls both Philadelphia and Puerto Rico home. While she currently resides in Philadelphia, where she serves as an adjunct instructor in Spanish at Holy Family University, Puerto Rico is where she spent 35 years serving as a teacher, principal and associate superintendent. When Hurricane Maria hit the island, Sr. Mary Ellen knew she had to do something to help the families she once served. Thanks to the support of students, faculty, administration and staff at Holy Family University, Nazareth Academy Grade School and Nazareth Academy High School as well as other Philadelphia schools, sisters at Mount Nazareth and HFU trustee Dominic Marano, Sr. Mary Ellen organized a canned food collection. The enormous effort resulted in six pallets of food weighing around 11,000 pounds -- that’s about 5,000 cans – for residents in Puerto Rico. However, collecting cans was only one part of the challenge. 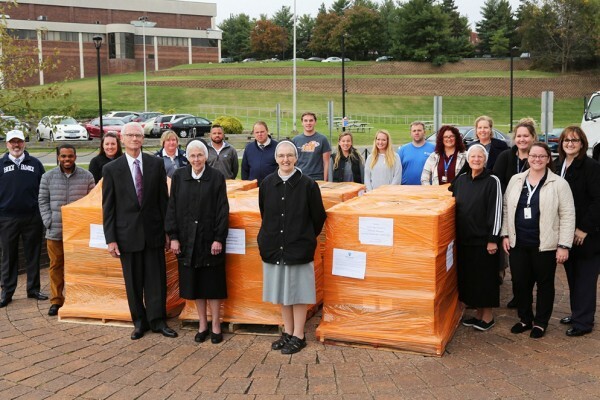 Sr. Mary Ellen also had to figure out how to ship over five tons of donated food to those in need. After many phone calls, and with the generosity of Marano Truck Lines who provided assistance preparing the items for shipping and American Airlines who agreed to transport the goods free of charge, the pallets were ready to be shipped to Puerto Rico. The food will be distributed by Caritas de Puerto Rico, a Catholic humanitarian group.